Written by Niall Duggan and Obert Hodzi. Statements made by leaders of China and the United States between 2014 and 2016 outlined the two countries’ joint actions and leadership to deal with the challenges of climate change. On eve of the G20 summit in Hangzhou in September 2016, President Obama finally announced an agreement by the US and China to ratify the Paris Agreement – but, the ‘honeymoon’ was short-lived. Hopeful that history would judge their efforts as pivotal, Obama declared the US-China agreement as demonstrative of the world’s two biggest greenhouse gas emitters’ exemplary leadership. However, Donald Trump’s threat to withdraw from the Paris Agreement and events at the 22nd session of the Conference of Parties to the UNFCCC (COP22) held in Marrakesh, Morocco, between 7th and 18th November 2016, seem to suggest the US-China joint leadership will not become a reality – instead China cast itself into global leadership on climate governance. As policymakers and environmentalists grappled to come to terms with Trump’s plan to cancel the Paris Agreement, President Xi Jinping seized the moment to demonstrate China’s global leadership capabilities. His administration outlined comprehensive actions taken by China to lead in driving the conference forward. Suggesting, as outlined by Xie Zhenhua, China’s representative on climate change affairs that “China is here to do something, not to show something” – a subtle attack on the United States’ showmanship devoid of action. 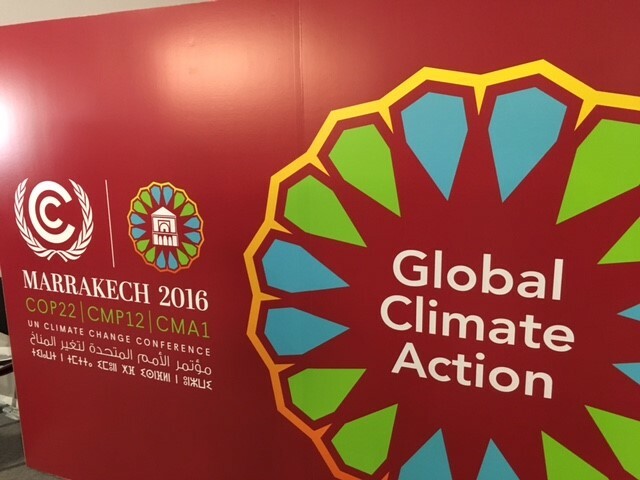 On the side-lines of COP22, China, together with Morocco, brought together senior UN officials and ministers from more than a dozen countries to discuss the role of South-South Cooperation in addressing climate change, building the capacity of developing countries, and exploring ways of financing climate change efforts and sustainable development. Proving its action-oriented approach, China showcased its South-South Climate Cooperation Fund. Xi Jinping’s administration also announced that it had invested 580 million yuan of aid and equipment to least-developed countries, with a particular focus on Africa. Further strengthening its leadership role on climate change, China launched 10 low-carbon demonstration projects. These projects include 100 climate change mitigation and adaptation projects, as well as training courses for 1,000 experts and officials. As outlined by the National Development and Reform Commission, Africa is a particular target of this project. China is also targeting funding toward Africa within the Renewable Energy Initiative under the Lima-Paris Action Agenda, and has targeted bilateral agreements with individual African counties to help those states reduce their carbon emissions. For example, China signed an agreement to cooperate with Namibia in the area of solar and wind energy, as well as a framework agreement to build the first nuclear power station in Sudan. Beyond its relations with Africa, China took advantage of the lack of a strong US presence at COP22 to gain a leadership position within global climate change governance, making it a natural partner for the European Union. As was the case at COP21 in Paris, China developed a strong relationship with the EU within COP22, where both actors worked as honest brokers among developing and developed nations. Giovanni La Via, the MEPs delegation chair to COP22 outlined this, stating that “In Marrakesh, we will have to work on the implementation of the Paris Agreement. We shall also work to consolidate the trust between developed and developing countries”. As the EU is a major source of clean energy technology and sustainable investment funds, the development of a Sino-EU alliance on climate change has a major effect on Sino-African relations within climate change. China is now seen by the EU as a gatekeeper to African countries’ support for climate change. For Xi Jinping’s administration, this is an unwelcome label, as the basis of Sino-African relations is that of equal partnership. China may fear that African nations may grow to resent China’s undertaking of this role as part of its climate change alliance with the European Union. As the soon-to-be Trump administration is clearly developing a climate change–denial position, it may be possible that climate change will be the first policy area where we see the long awaited Africa-China-EU–trilateral dialogue. China has clearly undertaken a leadership role at COP22. This has been possible due to the de facto withdrawal of the United States from global climate change governance with the election of Donald Trump. China has used this role to promote the rights of developing countries within the climate change debate. This has further strengthened its relationship with African states, who have benefited most from China undertaking this role. The European Union looks to China within COP22 as a partner and as a gatekeeper to the support of developing countries, particularly African nations. It is difficult to see whether China, a country that can be best described as a reluctant leader in international affairs, will embrace this new position, but if it chooses to, it will have a long-term effect on its all-weather friendship with Africa. Niall Duggan is a lecturer in international relations at the Department of Government University College Cork in Ireland. Obert Hodzi is postdoctoral researcher at the Department of World Cultures at the University of Helsinki in Finland. Image Credit: CC by MissionInnovationFlickr.